NEW FRONT BRAKE HOSE - GHP360 / PHD113. NISSAN SUNNY B11 1.3, 1.5 (82-86). 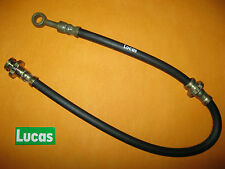 GENUINE LUCAS HOSE. NISSAN CHERRY N12 1.0, 1.3, 1.5 (82-86). NISSAN CHERRY N12 1.5 Turbo & ZX Turbo (83-86). CLG for Clear with Black Text, -CB for Carboline, -CL for Clear, -EB for Electric Blue. Nissan Sunny 1.6 Non ABS 1991-1995 Stainless Clear Cover With Goodridge Print Goodridge Brake Hoses SNN0650-4C-CLG. NISSA - SUNNY (140Y, 150Y) - 1.4 (HBL310) 01.70-02.82 08.78-12.80. NISSA - SUNNY (140Y, 150Y) - 1.4 (HBL310) 06.79-02.82 -12.80. NISSA - SUNNY (140Y, 150Y) - 1.5 (HBL310) 06.79-02.82 01.81-. NISSA - SUNNY Traveller (140Y, 150Y) - 1.4 (HBL310) 06.79-02.82 -12.80. Goodridge operates in the OEM, automotive, motorcycle, motorsport, defence and specialist industrial sectors. Feature - Goodridge employ over 300 staff worldwide with 9 Goodridge locations and over 250 handpicked distributors. Feature - Goodridge employ over 300 staff worldwide with nine Goodridge locations and over 250 handpicked distributors. 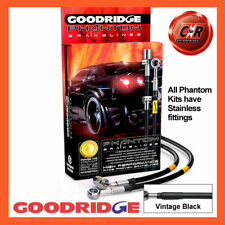 Goodridge is the worlds leading manufacturer of performance fluid transfer systems. Triscan 8150 14108 Nissan Brake Hose. Nissan Sunny Mk II Hatchback 1.3 (1986 - 1991) 44kW. Nissan Sunny Mk II Hatchback 1.6 (1986 - 1991) 62kW. Nissan Sunny Mk II 1.3 (1986 - 1991) 44kW. Nissan Sunny Mk II Hatchback 1.4 LX (1986 - 1991) 55kW. NISSA - STANZA Hatchback (T11) - 1.6 08.81-12.85 -. NISSA - STANZA Hatchback (T11) - 1.8 08.81-12.85 -. NISSA - STANZA (T11) - 1.6 08.81-12.85 -. NISSA - STANZA (T11) - 1.8 SGL 03.83-12.85 -. NISSA - SUNNY (140Y, 150Y) - 1.4 (HBL310) 01.70-02.82 01.78-. CLG for Clear with Black Text, -CB for Carboline, -CL for Clear, -EB for Electric Blue. Nissan Sunny 1.6 ABS 1991-1995 Stainless Clear Cover With Goodridge Print Goodridge Brake Hoses SNN0655-4C-CLG. Each Goodridge ABS brake line kit is manufactured using Stainless Steel ABS blocks, Stainless Steel fittings and PTFE hose wrapped in a Stainless-Steel braid with a PVC outer to stop dirt ingress. Nissan Sunny 1.6 Non ABS 1991-1995 Stainless Electric Blue Goodridge Brake Hoses SNN0650-4C-EB. Each Goodridge ABS brake line kit is manufactured using Stainless Steel ABS blocks, Stainless Steel fittings and PTFE hose wrapped in a Stainless-Steel braid with a PVC outer to stop dirt ingress. Nissan Sunny 1.6 Non ABS 1991-1995 Stainless Glow in the Dark Goodridge Brake Hoses SNN0650-4C-GW. Each Goodridge ABS brake line kit is manufactured using Stainless Steel ABS blocks, Stainless Steel fittings and PTFE hose wrapped in a Stainless-Steel braid with a PVC outer to stop dirt ingress. Nissan Sunny 2.0D ABS 1992-1995 Stainless Carboline Goodridge Brake Hoses SNN0655-4C-CB. CLG for Clear with Black Text, -CB for Carboline, -CL for Clear, -EB for Electric Blue. Nissan Sunny 1.4 ABS 1991-1995 Stainless Clear Cover With Goodridge Print Goodridge Brake Hoses SNN0655-4C-CLG. Each Goodridge ABS brake line kit is manufactured using Stainless Steel ABS blocks, Stainless Steel fittings and PTFE hose wrapped in a Stainless-Steel braid with a PVC outer to stop dirt ingress. Nissan Sunny 2.0D Non ABS 1992-1995 Stainless Carboline Goodridge Brake Hoses SNN0650-4C-CB. CLG for Clear with Black Text, -CB for Carboline, -CL for Clear, -EB for Electric Blue. Nissan Sunny 2.0D Non ABS 1992-1995 Stainless Clear Cover With Goodridge Print Goodridge Brake Hoses SNN0650-4C-CLG. CLG for Clear with Black Text, -CB for Carboline, -CL for Clear, -EB for Electric Blue. Nissan Sunny 2.0D ABS 1992-1995 Stainless Clear Cover With Goodridge Print Goodridge Brake Hoses SNN0655-4C-CLG.